Sonoma State University junior TJ Perez has been named the California Collegiate Athletic Association (CCAA) Men's Soccer Player of the Week after scoring a goal in each of the Seawolves' victories against Chico State and Humboldt State in the week of Sept. 21-27. 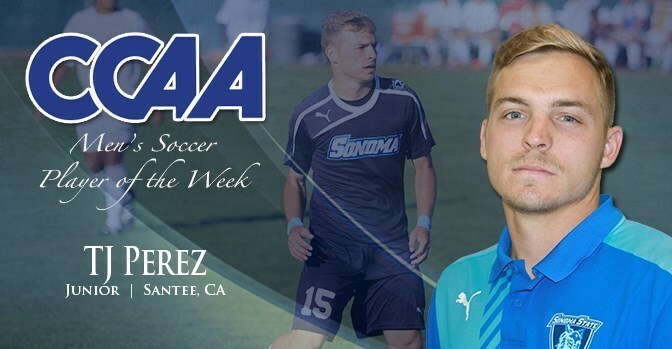 Perez becomes the first SSU men's soccer student-athlete since 2013 to receive the CCAA's weekly honor. Andrew Ogilvy snapped a scoreless tie in the 44th minute but the Sonoma State men's soccer team gave up the equalizer midway through the second half and was stunned with 10 seconds left in regulation when host Cal State Monterey Bay netted the go-ahead goal, suffering a 2-1 loss on Sunday, Oct. 4 in Seaside. Sonoma State and San Francisco State played to a 0-0 draw at Cox Stadium in San Francisco Friday, Oct. 2. Of 24 shots attempted by both teams, only 6 were on goal. With the draw Sonoma goalkeeper Mitch North completed his fourth shutout of the season. Kristal Luna scored in her third straight match on Sunday Oct. 4, and the goal in the 88th minute gave the 14th-ranked Sonoma State women's soccer team a 1-0 victory over Cal State Monterey Bay in Seaside. Luna provided both game-winning goals this weekend to keep the Seawolves unbeaten in CCAA play at 5-0-1 (7-1-2 overall). The San Francisco State Gators saw their seven-match unbeaten streak come to an end with the 1-0 loss to the Seawolves on Oct. 2. Kristal Luna broke the tie after a scoreless first half. Sonoma State finished with a 16-8 shot advantage in the match, including 6-2 on goal. For the second straight night, the Sonoma State women's volleyball team trailed 2-1 in the match, but finished with a thrilling five-set victory over UC San Diego (28-26, 21-25, 21-25, 25-22, 15-12) on Saturday, Oct. 3 at The Wolves' Den in Rohnert Park. The Seawolves have won six straight matches to improve to 10-3 overall and remain in sole possession of first place in the CCAA with a 6-1 mark against conference opponents. The Sonoma State women's cross country team enjoyed its best-ever finish at its own Sonoma State Invitational on Saturday Oct. 3, placing second out of seven teams with a score of 63, led by a career-best fifth place finish by Maria Hurtado, who traversed the six-kilometer course at Spring Lake Regional Park in Santa Rosa in 22:50. Starting the day in third place, the Sonoma State men's golf team fought their way into a three-way first place tie going into the final holes before finishing 4th at the WNMU Fall Intercollegiate on Tuesday, Sept 29. Highlighted by the play of Justin Shluker who finished in the top ten, the Seawolves combined to shoot a 288, slotting them just four strokes behind champion Cal State Monterey Bay and one behind the third place team and host, Western New Mexico. Alexis Hayes fired a squad-best 74 on Tuesday, Sept. 29 as the Sonoma State women's golf team closed out play at the GolfScrimmages.com National Preview in seventh place overall. The Seawolves followed up the previous day's 304 with a 306 to move up a two spots in the team ranking. It is their second straight seventh place finish to start out the 2015-16 season. Jordyn Kearney and Jensyn Warren of the Sonoma State women's tennis team made a memorable run at the 2015 USTA/ITA West Region Championships, but saw their quest for a doubles title fall short as the team of Scott and Mosser from UC San Diego emerged with an 8-5 win on Saturday, Oct 3. The Sonoma State men's tennis team kicked off their fall season this weekend at the 2015 USTA/ITA West Region Championships. After picking up a pair of wins, Daniel Holz came up just short in his bid for the consolation singles title on Saturday, Oct. 3, losing 8-2 in the final to Erion of Point Loma Nazarene.